Manufactured in 2.5mm thick steel and generously powder coated in red, our steel rims are strong and durable to give years of trouble-free service. 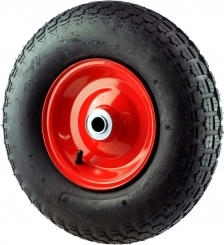 Coupled with good quality tyres and tubes, our pneumatic wheel range covers all the common sizes used on wheel barrows, hand trucks, trolleys, and small machinery and equipment. A selection of bearing sizes is available in each wheel to suit most axle sizes. Pneumatic wheels are ideal for moving loads over rough, uneven or soft surfaces. They are also popular for use on machinery, equipment and trolleys where a softer ride is required to limit vibration and possible damage.